Ruthiebear (Titusville, NJ, United States) on 9 November 2014 in Cityscape & Urban. Quel dessin et vue quel vert superbe image et captage fantastique. Old house could tell a lot. All stories may not be fun. Still, it would be important that the history of the building would be retained. A grand old building and love the thatch over the sign. Lovely view of the old building through the greens !!! Tu as vraiment trouvé le bon traitement pour tes photos dans ce domaine, un joli rendu de la couleur avec une ambiance de noir et blanc... j'aime beaucoup ! ***** bon dimanche ! Beautiful composition and great treatment ! Pontiac is famous! Great capture. Is that a for sale sign? I want to buy it. Good compo, lovely iron work yesterday. Very nice composition and excellent treatment, the colors are beautiful. This building is an old mill? Excellent photo, I like a lot. Traitement qui rend moins triste ce bâtiment visiblement à l'abandon ! Treatment makes it less sad obviously abandoned building! Wonderful shot in the excellent framing. Stunning treatment. I like when the community identifies the historic places around their city. Great historic identity! Like the treatment here! Superb composition Ruthie !! Your wonderful processing and very fine framing is dreamlike !! Excellent details everywhere !! it will not be cheap ! Nice job ! This is beautiful. Wonderful colors and detail. 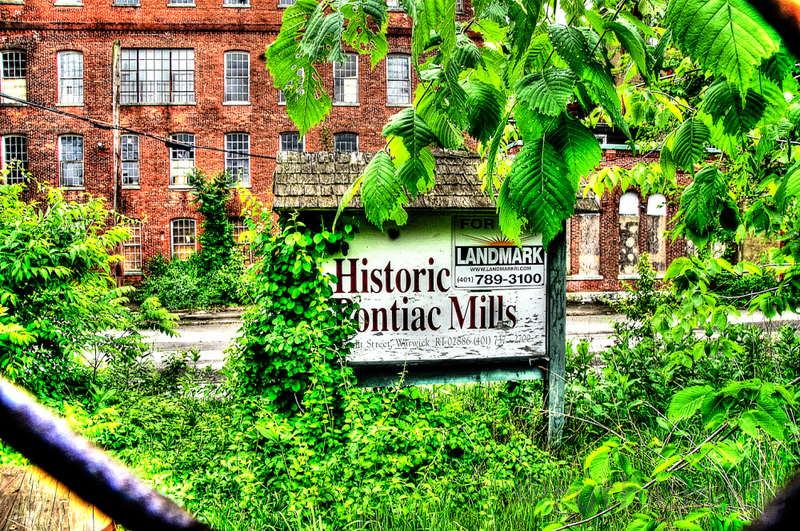 Neat shot of the old mill. It would be great if someone could rehabilitate the building and put it to good use. I like that you included the sign. Beautiful green. Nice color contrast. That is such a beautiful building. I hope that it can be saved and restored and put to good use. That is a great old building. The shot makes me feel quite voyeuristic. Spying on someone. Very effective processing and placement of the sign in the frame.